Part of Digimedia Limited Casinos and kicking around the iGaming industry since 2010, Euro Palace might have a distinctly European name, but that doesn’t mean there aren’t dollars to be won. With the option to set your home country to New Zealand and NZ$ being one of the main currencies, you should feel right at home regardless of where you live. Of course, Euro Palace is merely a name at the end of the day and what really matters is what’s under the hood. In this instance, Microgaming is the software provider behind the bulk of Euro Palace’s gaming options, and that means two things. Firstly, you’ll get to choose from more than 600 games. Secondly, anything you play will be 100% safe, secure and, importantly, fair. Microgaming has been creating online casino games since the industry’s inception back in the early nineties and, on top of this experience, it complies with every regulation there is. With eCOGRA certifying every game is truly fair and the results completely random, you can rest assured that Euro Palace can deliver a well-stocked, fair gaming experience, regardless of whether you’re European or not. The Euro Palace welcome bonus is based on two things: free spins and cash. As a newbie, you’ll automatically get access to a deal worth 100 free slot spins and up to NZ$500 in bonus cash. Now, as is the case with welcome bonuses of this type, the free spins are fixed while the cash is variable. In simple terms, this means the number of spins you’ll get won’t change regardless of the amount you deposit. So, even if you’re a complete beginner, this welcome bonus is great because you know that, as long as you meet the NZ$10 minimum deposit, you’ll get a decent amount of free spins. OK, so bonus cash might be more instantly gratifying, but the fact that you will get a free spins reward of the same size as a high roller is great news in our opinion. Once you’ve created your account, you’ll have seven days to unlock these bonuses before playing through the 40x wagering requirements. In comparison to other NZ online casinos, 40x isn’t too far from the average. OK, so high volume players will find it easier to meet the playthrough so they can request a withdrawal penalty-free. However, with slots having a 100% contribution weighting and there being more than 300 spinners to choose from, it should still be pretty simple for casual players to unlock their bonus. As we’ve said, Euro Palace is part of the Microgaming Network, which means there are games aplenty for both free play and real money players. In fact, when you scroll through the game menu (located in a pop-up tab at the bottom of the homepage), you’ll see that all the main bases have been covered. From slots and blackjack to roulette and video poker, there are hundreds of ways for you to play every casino classic you can think of. However, the areas where Euro Palace stands out are the casual games and tournaments. For those looking for games that are a little less traditional but a lot more entertaining, the “casual games” lobby is where you’ll find an arcade and bingo-style games such as Keno, Super Bonus Bingo and Hexaline (a game based on the UK TV show Blockbusters). If you’re someone with a competitive streak, then Euro Palace Casino’s tournaments are for you. Taking place at various times throughout the day and mainly focused on slots, these casino tournaments not only add an extra element of entertainment but also give you the chance to win some serious cash. Indeed, events such as the Monthly Monster have more than NZ$25,000 up for grabs and all it takes to win is a ticket (entry costs NZ$10) and a few successful spins! Euro Palace doesn’t have dedicated mobile apps available in the Apple Store or Google Play. However, all New Zealanders can still game on the go courtesy of the site’s mobile-ready software. In fact, what’s great about Euro Palace is that it tells you exactly which games can be played via your iOS, Android, Blackberry or Windows Phone device. As you scroll through the main lobby, you’ll notice that each game box has an icon or two inside it. For those wanting to know if the game is worth playing or not, the ice or fire icons signal whether it’s “cold” (it hasn’t paid out a jackpot recently) or “hot” (it paid out some big prizes recently). In line with this, games that are available for mobile players will have a phone icon in the top right of each game box. Although Euro Palace hasn’t made every game available for mobile, you won’t be short of options. In fact, with a live dealer, online pokies, table games and even some tournaments being open to mobile casino fans, you can have just as much fun on the run as you could if you were sat at home on your computer. Moving money into and out of your Euro Palace account is not only safe but also very simple. Thanks to SSL encryption, your transactions will always be protected, while established payment processors such as Visa, MasterCard, Neteller, Skrill and Flexepin will handle your funds in the most efficient ways possible. When it comes to deposits, Euro Palace will credit your account instantly, while withdrawals will be processed within 3 to 5 days in most instances. However, if you’re looking for a faster way to get paid, eWallets (such as Neteller and Skrill) can help you collect your winnings within 24 hours. To unlock some added extras at Euro Palace, all you have to do is play for real money. Thanks to a four-tier loyalty scheme, you can earn monthly bonuses based on your play and even turn points into cash whenever you like. Silver = Starting level where you’ll get 2,500 points for making your first deposit. Gold = Earn at least 10,000 reward points in a single month. Platinum = Earn at least 25,000 reward points in a single month. Diamond = Earn at least 75,000 reward points in a single month. Once you hit the 5,000 point mark, you can start exchanging points for dollars at a rate of NZ$1 per 1,000 points. 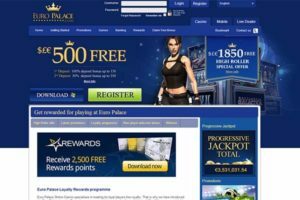 This cash can then be used to play any games on Euro Palace, which basically means you’ll be turning time and effort into opportunities and money. For an online casino that’s secure, full of options and capable of giving you more for your time online, Euro Palace is perfect. OK, so the name might imply that Kiwi players are out of place, but that couldn’t be further from the truth. In fact, with dollars on display and games designed for all operating systems, it really doesn’t matter where you come from or what you want to play. As long as you’re aged 18+ and have an internet connection, Euro Palace will give you access to hundreds of high-quality casino games and, importantly, hundreds of exciting ways to win.